With the front side dominated by a touch-screen and a lone, round button, the Nexus One appearance is similar to that of most contemporary smartphones. The reverse sports a 5 megapixel camera with LED flash, a Google logo, and a smaller HTC logo. Power button, volume control, and headphone and micro-USB sockets are found along the edges. It is with appreciation I note the lack of a front-facing camera; the silly idea of video calls is finally put to rest. Powering up the phone (I’m beginning to question the applicability of that word), I am immediately enamoured with the display. At 800×480 pixels, the AMOLED display is crystal-clear and easily viewable even in bright light. 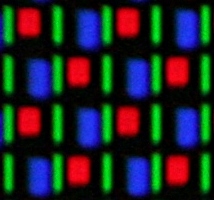 In a darker environment, the display automatically dims. The display does have one quirk in that the subpixel pattern doesn’t actually have a full RGB triplet for each pixel. The close-up photo below shows the pattern seen when displaying a solid white colour. The result of this is that fine vertical lines, particularly red or blue ones, look a bit jagged. Most of the time this is not much of a problem, and I find it an acceptable compromise for the higher effective resolution it provides. The Android system is by now familiar, and the Nexus offers no surprises in basic usage. All the usual applications come pre-installed: browser, email, calendar, contacts, maps, and even voice calls. Many of the applications integrate with a Google account, which is nice. Calendar entries, map placemarks, etc. are automatically shared between desktop and mobile. Gone is the need for the bug-ridden custom synchronisation software with which mobile phones of the past were plagued. Launching applications is mostly speedy, and recently used apps are kept loaded as long as memory needs allow. Although this garbage-collection-style of application management, where you are never quite sure whether an app is still running, takes a few moments of acclimatisation, it works reasonably well in day to day use. Most of the applications are well-behaved and save their data before terminating. Two email applications are included out of the box: one generic and one Gmail-only. As I do not use Gmail, I cannot comment on this application. The generic email client supports IMAP, but is rather limited in functionality. Fortunately, a much-enhanced version, K-9, is available for download. The main feature I find lacking here is threaded message view. The features, or lack thereof, in the email applications is not, however, of huge importance, as composing email, or any longer piece of text, is something one rather avoids on a system like this. The on-screen keyboard, while falling among the better of its kind, is still slow to use. Lack of tactile feedback means accidentally tapping the wrong key is easily done, and entering numbers or punctuation is an outright chore. Whatever the Nexus lacks in email abilities, it makes up for with the browser. Surfing the web on a phone has never been this pleasant. Page rendering is quick, and zooming is fast and simple. Even pages not designed for mobile viewing are easy to read with smart reformatting almost entirely eliminating the sideways scrolling which hampered many a mobile browser of old. Being a phone, the Nexus One is obviously able to make and receive calls, and it does so with ease. Entering a number or locating a stored contact are both straight-forward operations. During a call, audio is clear and of adequate loudness, although I have yet to use the phone in really noisy surroundings. The other traditional task of a mobile phone, messaging, is also well-supported. There isn’t really much to say about this. Having a bit of an interest in most things multimedia, I obviously tested the capabilities of the Nexus by throwing some assorted samples at it, revealing ample space for improvement. With video limited to H.264 and MPEG4, and the only supported audio codecs being AAC, MP3, Vorbis, and AMR, there are many files which will not play. To make matters worse, only selected combinations of audio and video will play together. Several video files I tested played without sound, yet when presented with the very same audio data alone, it was correctly decoded. As for container formats, it appears restricted to MP4/MOV, and Ogg (for Vorbis). AVI files are recognised as media files, but I was unable to find an AVI file which would play. With a device clearly capable of so much more, the poor multimedia support is nothing short of embarrassing. Much of the hype surrounding Android revolves around the Market, Google’s virtual marketplace for app authors to sell or give away their creations. The thousands of available applications are broadly categorised, and a search function is available. The categorised lists are divided into free and paid sections, while search results, disappointingly, are not. To aid the decision, ratings and comments are displayed alongside the summary and screenshots of each application. Overall, the process of finding and installing an application is mostly painless. While it could certainly be improved, it could also have been much worse. The applications themselves are, as hinted above, beyond numerous. Sadly, quality does not quite match up to quantity. The vast majority of the apps are pointless, though occasionally mildly amusing, gimmicks of no practical value. The really good ones, and they do exist, are very hard to find unless one knows precisely what to look for. Packing great performance into a pocket-size device comes with a price in battery life. The battery in the Nexus lasts considerably shorter time than that in my older, less feature-packed Nokia phone. To some extent this is probably a result of me actually using it a lot more, yet the end result is the same: more frequent recharging. I should probably get used to the idea of recharging the phone every other night. The Nexus One is a capable hardware platform running an OS with plenty of potential. The applications are still somewhat lacking (or very hard to find), although the basic features work reasonably well. Hopefully future Android updates will see more and better core applications integrated, and I imagine that over time, I will find third-party apps to solve my problems in a way I like. I am not putting this phone on the shelf just yet. How does the browser compare to the iPhone? I don’t have an iPhone, so I can’t easily compare. The screen has more than twice the resolution though. About the screen, sorry I don’t find anything spectacular in this amoled, yes, it is bright (when you are in the dark) but totally unusable in bright daylight. Also the amoled subpixel pattern that lacks a true RGB triplet for every pixel gives small fonts colored edges and makes them look jagged. I have yet to see a phone display that works in direct sunlight. The Nexus display is fine in English daylight. As for the subpixel layout, if I look carefully I do indeed notice something is a bit off. It seems to be using something like a Bayer pattern. i’m pretty sure android also supports h263, although i havent tried it on my droid. the sdk can also encode only h263 out-of-the-box. None of the H.263 samples I tried would work. I’m pretty sure Nexus One is able to both slightly vibrate and play sound when you tap on the keyboard. When the soft-keyboard is on, tap and hold Bottom-Left-most button (?123) and choose ‘Android keyboard settings’. You can do this from the main ‘settings’ as well. I don’t know about IMAP, but you can have GoogleMail to hourly check your POP3 emails and access them from GoogleMail. Yes, the phone can vibrate on keypress, but that does not help me feel the location of the keys before pressing them. Regarding email, I don’t know what purpose fetching mail into gmail would serve, nor would I want my email there.